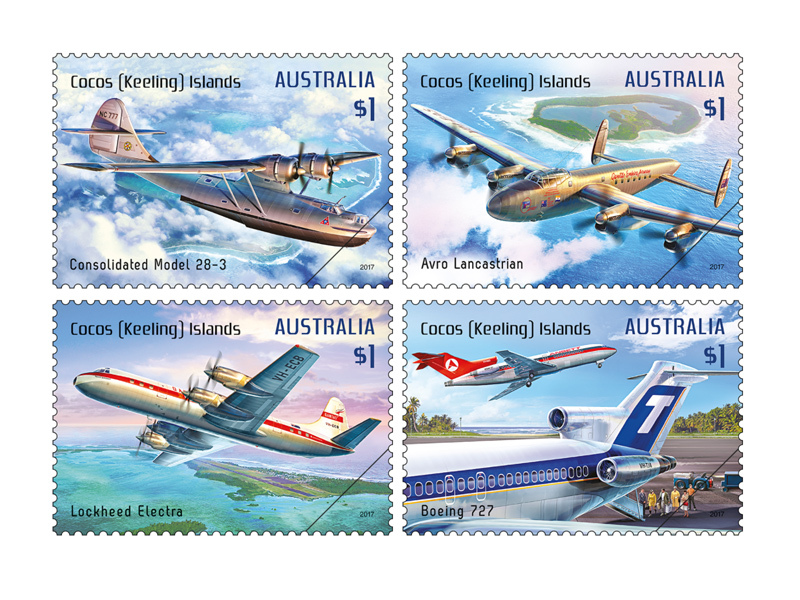 Cocos (Keeling) Islands’ connection with aviation began in 1939, with an Australian government survey flight directly linked to our postal history. The flight was made to determine the feasibility of an alternative airmail route to England in the event that war broke out in Asia. This was the first-ever flight across the Indian Ocean and carried a small number of unofficial postal items. Cocos was not greatly affected by World War II until Japan joined the conflict and began occupying territory in South-East Asia, including Java and Singapore in 1942. Under a directive of Lord Mountbatten, the British built an airstrip on West Island, completed very quickly in March 1945. Bomber and fighter planes of the Royal Air Force operated from the airstrip until the end of the war. The small population of islands was greatly swelled, with more than 8,000 military personnel in situ at the peak of this period. For a short time before Singapore became available again, Qantas also used the airstrip at Cocos on its early postwar regular service on the main “Kangaroo Route” to the United Kingdom. The service operated Sydney–Perth–Cocos–Colombo–Karachi. After Qantas and the Royal Air Force withdrew by March 1946, the aerodrome facilities fell into disuse. As a precursor to re-starting commercial aviation to Cocos, in November 1948 Qantas made a test flight – carrying 300 special covers (not created by the Postmaster-General’s Department) – to survey the route between Sydney and Johannesburg. Following the success of the survey flight the Australian government purchased the old airstrip on West Island in 1951 and around 500 Royal Australian Air Force members began rebuilding the facilities, which were completed in July 1952. (Cocos (Keeling) Islands did not become a territory of Australia until 1955.) Scheduled services commenced on 1 September 1952, with Cocos becoming an Indian Ocean refuelling post on the long-haul flight between Sydney and Johannesburg (also stopping at Mauritius). One return service a fortnight operated on what was known as the “Wallaby Route”. In 1963, Qantas introduced the Lockheed L-188 Electra turboprop, which shortened the flying time from 61 hours, 40 minutes on the Super Constellation to 54 hours. The introduction of the Boeing 707 jet in 1967 made the refuelling stopover at Cocos redundant, bringing to an end this chapter of the islands’ aviation history. In order to maintain air services to the islands, and with Australia’s “two airline policy” being in operation, from 1967 Australia’s two main domestic airlines, Ansett Airlines of Australia and Trans Australia Airlines (TAA), flew charter flights between Cocos and Perth. In the years since, a variety of operators and aircraft types have operated services to Cocos, but today only Virgin Australia Airlines operates commercial passenger flights between Cocos (Keeling) Islands and Perth. 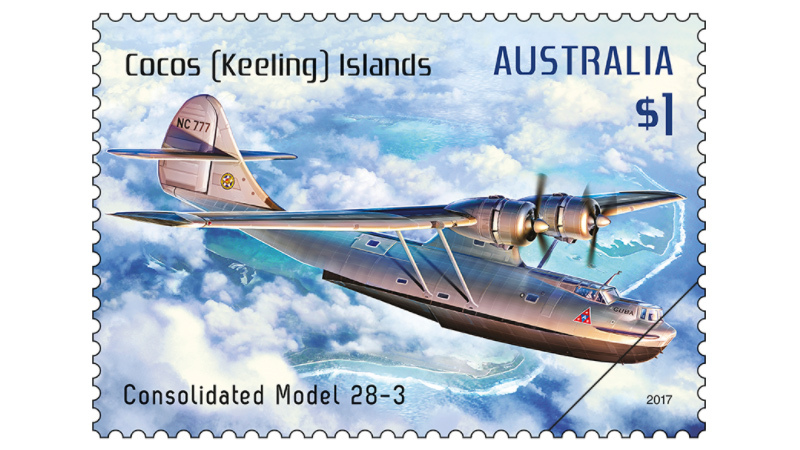 This stamp design represents the first-ever flight to Cocos (Keeling) Islands, a survey for a new route to deliver airmail to England, in case war broke out in Asia and interrupted the Empire route. It was undertaken by Consolidated Model 28-3, NC777 Guba, a civil version of the Catalina flying boat. 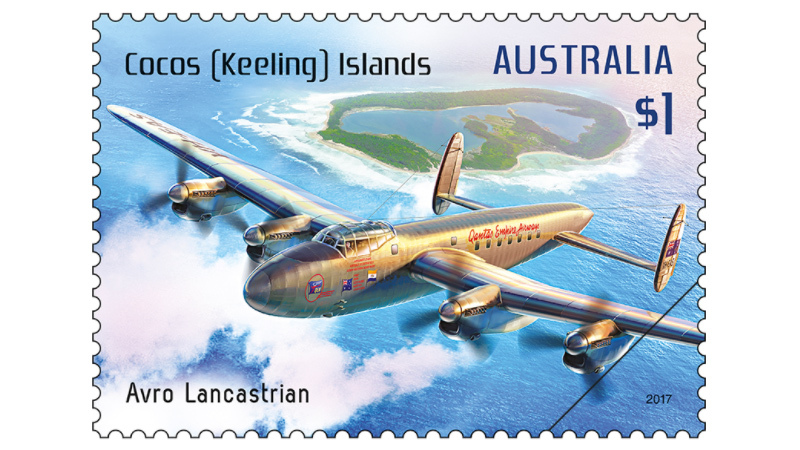 The Avro 691 Lancastrian VH-EAS shown in the stamp design represents the 1948 survey flight by Qantas Empire Airways, made to ascertain the practicality of the “Wallaby Route” between Sydney and Johannesburg. 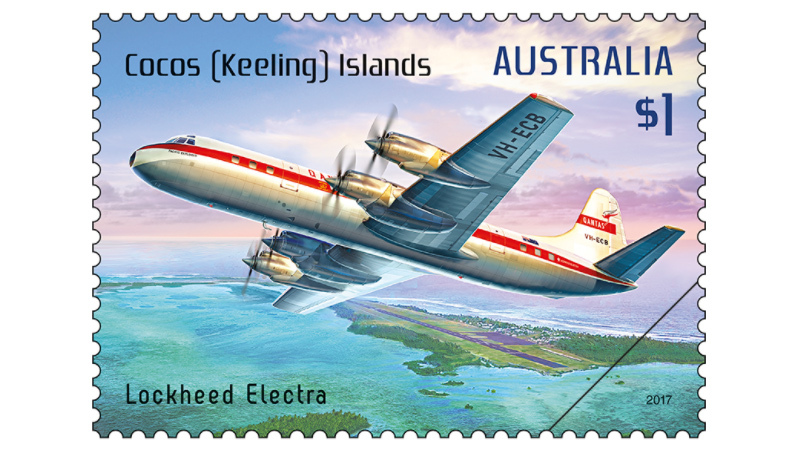 The third aircraft type operated by Australia on the Wallaby Route, after the Constellation and Super Constellation, was the Lockheed L-188 Electra, which then gave way to Boeing 707s in 1967, at which time Cocos ceased to be a stop on the route. The aircraft in the stamp is VH-ECB Pacific Explorer. This stamp represents the “two-airline policy” of the 1970s, which saw Ansett Airlines of Australia and TAA flying charter flights between Cocos and Perth using Boeing 727s. 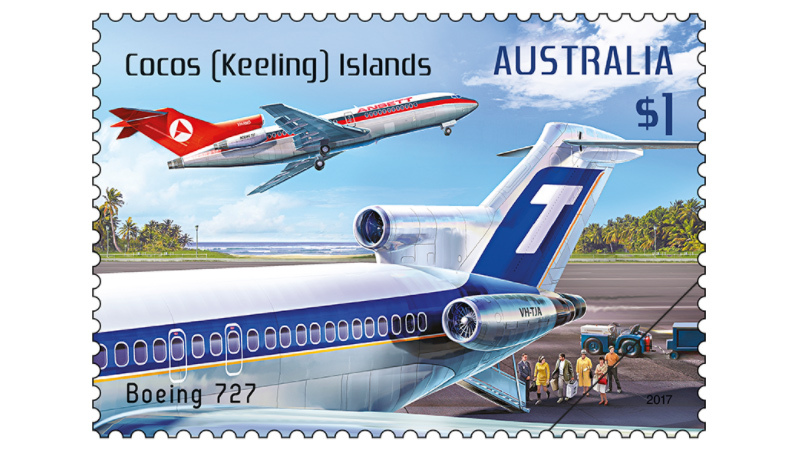 The aircraft in the foreground on this stamp is VH-TJA James Cook, a TAA Boeing 727-76.